The Sustainable Development Goals (Goal 6) calls for universal and equitable access to safe and affordable drinking water for all by 2030, as well as access to adequate and equitable sanitation and hygiene for all, and an end to open defecation, paying special attention to the needs of women and girls and those in vulnerable situations. This requires the development and maintenance of effective water, sanitation and hygiene (WASH) systems. It is not just about pipes and tubes. WASH systems, if examined closely, consist of many overlapping and interacting sub-systems and meta-systems, including physical, institutional, political, social, financial, and other systems. Finding sustainable solutions to the WASH crisis requires that these sub-systems be synced. It requires a willingness to work across disciplines and a new way of thinking and describing the issues. In drawing the relevant boundaries for a particular context. One of the sub-systems that is often not sufficiently addressed—or deliberately left out—is the shadow system of corruption. This shadow system exists in WASH systems throughout the world. It syphons off money and water, undermines skills and capacity, prevents us from reaching the SDG targets for goal 6, and contributes to the ongoing violation of the human rights to water and sanitation. It is active, present, and often skilfully managed by those involved. By not addressing the shadow system, we jeopardize our ability to make water and sanitation systems work and to deliver on the SDGs. The personal business interests of officials may run counter to their public duties. In South Africa, for example, it has been alleged that some municipal politicians and officials own water tankers and therefore have a financial stake in the failure of piped water systems. Water allocation may be skewed towards those with money, power, and access to decision-makers. Decisions on where to implement water and sanitation schemes may be biased by political concerns, ethnicity, religion or other influences. This results in a failure to provide services to those who don’t meet these arbitrary criteria. Decisions not to enforce licence conditions for abstraction and pollution discharge may reflect a lack of integrity, or may, indeed, reflect active corruption. Individuals may be required to pay a bribe in order to get access to services, or may opt to pay bribes to get water bills reduced. Women and girls face a particular vulnerability at this level, with sextortion requiring them to make their bodies available to male officials in return for access to affordable services. Whatever their forms, corruption and lack of integrity in the water sector lead to higher costs and reduced access to water, especially for the poor and most vulnerable. Such actions reduce the sustainability of water and sanitation services, and of water services institutions. They contribute to inequitable water resources allocation, reduced water security, uncontrolled and illegal pollution, over-extraction of groundwater, the degradation of ecosystems, and the violation of the rights to water and sanitation. The actual costs of corruption and lack of integrity are hard to measure since, by their nature, these dealings take place in the shadows, unrecorded. Only a small part of the iceberg breaks the surface into daylight. Estimates, however, suggest that they add costs of between 10 – 45%. According to the Water Integrity Global Outlook of 2016 between US$ 770 billion and $1,760 billion is needed annually to develop water resources and services worldwide. A 10% loss is already equal to a loss of $80 to 170 billion per annum. That is only estimating the direct financial costs of corruption, not the indirect social and environmental costs such as reduced health and lost productivity, and the time costs of collecting water. A recent study on Identifying and Reducing Corruption in Public Procurement in the EU, conducted by PWC found that 27% of projects analysed involved kickbacks and 14% showed a conflict of interest type of corruption. While the study was not water sector specific, it included the water and waste sectors. The study also found that, on average, the estimated probability of corruption is higher in water and waste compared to other sectors and ranges from 25% to 35%. The estimated direct costs of corruption in public procurement in the water & waste sector in the eight Member States studies ranged between EUR 27 million and EUR 38 million (or 1.8% and 2.5% of the total procured amount). Addressing corruption and lack of integrity is a critical element of making water and sanitation systems work and delivering on the SDGs. 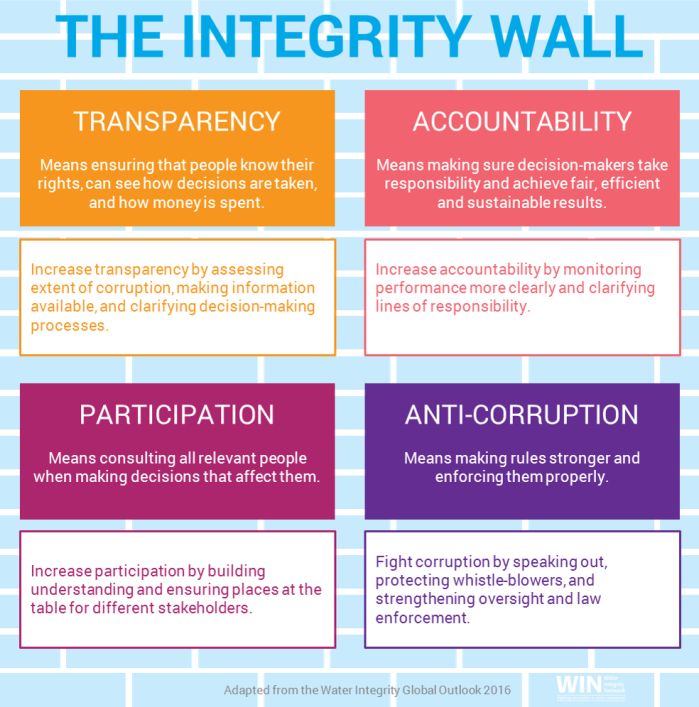 Some ways to move forward and keep out corruption are outlined in the Integrity Wall, which stands on four pillars: transparency, accountability, participation and anti-corruption measures. The Water Integrity Network develops and works with a suite of tools related to these pillars and builds capacity amongst civil society, government and the private sector. The Kenya Water Services Trust Fund developed a system called Maji-data which is freely available online and which shows all projects that they have funded across the country. The Guma Valley Water Company in Sierra Leone took control of its billing system by analysing historical water use relative to payments for water, thus turning around a shadow system of negotiating low water bills in exchange for personal payback. This resulted in both greater revenue to the company and a better investment profile for donors and other investors. Research is also providing new insights. It shows for example that gender and diversity on Boards and in management reduces the likelihood of corruption because they serve to break in-group thinking and behaviour. 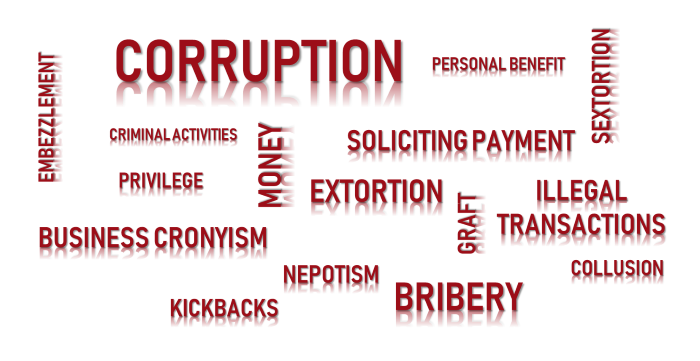 However, overall corruption remains a scourge that is all too present. It is a dark shadow that we need to shine a bright light on as we progress towards 2030 and the target of providing water and sanitation to all.